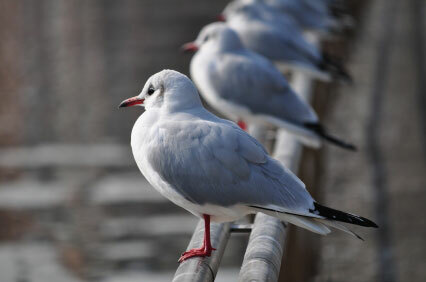 Bird Control Service Inc. was established as a service company to satisfy the concerns of commercial, industrial, institutional and military building owners with nuisance pest bird problems. Our goal is to safely remove and prevent any possible sources of infestation. Bird Control Service Inc. has over 30 years of experience controlling nuisance pest birds in all types of situations and locations. Experience in the field of bird control service was gained in both practical field work and experimental application work. We have worked to provide solutions in both commercial and residential settings. Over the years, we have come to know what will work and what will not for each situation. Our vast amount of experience and knowledge ensures that we can effectively approach all sorts of situations. Bird Control Services is a company dedicated to proper service. We realize that no situation is the same, so we enter each new situation with an open mind. We do not subscribe to one cure fits all. No preconceived solutions or products are ever brought to the property inspection and forced to solve your concern. We uniquely tailor our approach to the needs of our clients, ensuring that they are met before proceeding, while completing the job in a timely and effective manner. It is our top priority to meet the needs of our clients. We strive to provide uniquely crafted solutions that safely and effectively eliminate all of our clients’ bird-related problems.